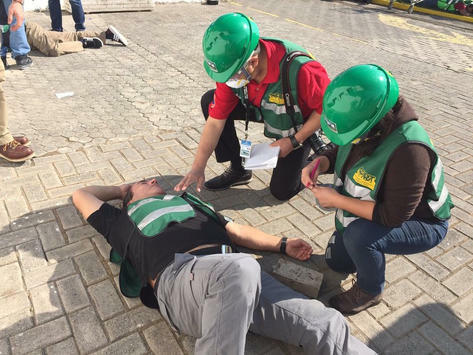 “The Community Emergency Response Team (CERT) program educates volunteers about disaster preparedness for the hazards that may impact their area and trains them in basic disaster response skills, such as fire safety, light search and rescue, team organization, and disaster medical operations.” [ 1 ] “CERT training provides life saving skills and techniques for people who will rely on each other for help in the time of need” [ 2 ] and can be a useful addition to the skill sets of Amateur Radio operators engaged in providing Public Service Communication support. The required classroom training for CERT volunteers is provided in the Fargo/Moorhead area by Red River CERT. A downloadable PDF flyer for the 2017 classes is available. or call 701-476-5991 for more information. [ 1 ] “Community Emergency Response Team”, ready.gov—Official website of the Department of Homeland Security, Retrieved December 3 2017, https://www.ready.gov/community-emergency-response-team. [ 2 ] “Red River CERT”, The City Of Fargo, Retrieved December 4 2017, http://www.fargond.gov/city-government/departments/emergency-management/community-emergency-response-team-cert. “Community emergency response team”, Wikipedia The Free Encyclopedia, Retrieved December 4 2017, https://en.wikipedia.org/wiki/Community_emergency_response_team.